Art Mortimer was born in Long Beach, California, and is a graduate of Occidental College in Eagle Rock, California. He moved to Santa Monica in 1965, and has been working as a free-lance artist since 1969, doing both commercial and fine art. He painted his first mural in 1971 on the side of the house he was living in, at the beach in Santa Monica. Also in 1971 he worked with artist/film maker Terry Gilliam in London on a series of short animated films that became a part of a Marty Feldman television series shown in the USA. He gave up his commercial art business in 1988 to concentrate on murals, paintings and drawings. He lived and worked at the beach in Santa Monica until December 2002, in West Los Angeles until December 2013, and now resides in Twentynine Palms, CA. Since 1971 he has painted nearly 100 murals, including major public murals in Claremont CA, Billings MT, 29 Palms CA, Lompoc CA, Susanville CA and many Southern California communities. Among many other murals, he has painted a 300 ft. long History of Long Beach mural in that California beach city (2003); a 4-story high mural in downtown Santa Monica about the beach, commissioned by the Milken Family Foundation (1998); a mural on Fairfax Ave. in Los Angeles depicting the history of the Jewish community in Los Angeles (1985); one on the side of Brandelli's Brig bar on Abbot Kinney Blvd. in Venice (1973); a large piece in the new corporate headquarters of Rockwell International in Seal Beach CA (1992); a mural on the history of Century City in the lobby of a high-rise office building in Century City (1991); a large mural on the side of Bloomingdale's department store in New York City for the State of California depicting the various regions of California (1989); and many private commissions. Considered one of the originators of the mural movement in Los Angeles, his mural work has been featured in numerous exhibitions and photographic collections, as well as in newspapers, magazines, books, television and films all across the United States and in many countries around the world. He was honored as Artist of the Year in 2004 by the City of Long Beach, CA. 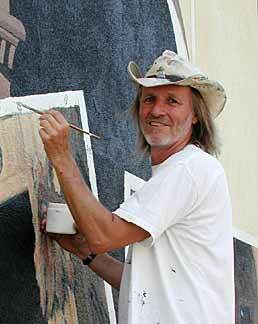 He is currently teaching Mural Painting at Los Angeles Trade Technical College in downtown Los Angeles. He has been a part-time faculty member at Loyola Marymount University in Los Angeles where he taught Landscape Painting, Mural Painting, Plein Air Painting, as well as Life Painting and Painting I and II. He has also taught classes and workshops on mural painting in a variety of schools and communities. Art is a member of the Board of Directors of the California Public Art and Mural Society (CalPAMS), and a member of the National Society of Mural Painters and the California Art Club. Southwest Art, April 2009, pages 60-65, "Murals and More," a 6-page article on Art's murals and paintings. The Artist's Magazine, November 2010, pages 68-70, "Sketching in the Rough," a 3-page article on Art's sketching for painting studies. Southwest Art, September 2012, page 82, "Urban Impressions," a 1-page feature on Art's urban landscapes, and on page 53 a full-page ad for his studio and plein air paintings. Sketchbook Confidential: Secrets from the private sketches of over 40 master artists. Editors of North Light Books, North Light Books, Nov 2010. Mural Art: Murals on Huge Public Surfaces Around the World from Graffiti to Trompe L'oeil. Kiriakos Iosifidis, Publikat, Nov 2009. Large Art in Small Places: Discovering the California Mural Towns. Kevin Bruce, Ten Speed Press, May 2009. Oasis of Murals: Twentynine Palms, California. Action Council for Twentynine Palms, Inc., 2009. Painting the Towns: Murals of California. Robin J. Dunitz & James Prigoff. RJD Enterprises, 1997. Community Service Award, City of Long Beach CA, awarded for Outstanding Community Service for National Community Development Week, April 2006. Best Public Improvement Award, City of Covina, for Covina Park Pavilion Bandshell Murals, 2005. Artist of the Year, Long Beach, CA Public Corporation for the Arts, 2004. Claremont Architectural Commission 20th annual "Award of Excellence" for Claremont Village Mural, Claremont CA, April 2001. 1996 Design Award, for Villa Alamitos mural, "Neighborhood Designs That Work, Building A Better Long Beach, Trompe l'Oeil Mural Project," Long Beach, CA Department of Building and Planning. Bright N' Beautiful Award, for South Park Mural, Billings, Montana: one of the top ten civic beautification projects in Billings in 1996. 2016 My painting "The Sentinel" exhibited in the LA Art Show at the LA Convention Center, Los Angeles CA. 2012 "Pacific Ocean," One-person show, Schomburg Gallery, Bergamot Station, Santa Monica, CA. 2008 "Pacific Breeze," Schomburg Gallery, Bergamot Station, Santa Monica, CA. CA. 2006	 "Pacific Sands," Schomburg Gallery, Bergamot Station, Santa Monica CA. 2004	 "Flowing Water, Fruitful Valleys," Pasadena Museum of History, Pasadena CA. 2003	 "Pillars," Laband Art Gallery, Loyola Marymount University, Los Angeles CA. "On Route 66," Tirage Gallery, Pasadena CA. 2002	 "Plein Air Painting," Tirage Gallery, Pasadena CA. 2001	 Chinatown Art Festival, Hong Kong Gallery, Los Angeles CA. "Urban Landscape," Tirage Gallery, Pasadena CA. 2000	 One-Person Show, Seidman Gallery, Santa Monica CA. 1999	 One-Person Show, Seidman Gallery, Santa Monica CA. 1995	 "Art On The Pier," One Person Show on the Santa Monica Pier, Santa Monica CA. 1994	 "Holiday Art Show," Spring Street Gallery, Los Angeles CA. "L.A. Rhythms," Spring Street Gallery, Los Angeles CA. "Paintings, Drawings, etc.," One Person Show, Higher Grounds Gallery, Los Angeles CA. "Art by Artists and Other Faces," Occidental College, Los Angeles CA. 1993	 "Paintings and Drawings, Recent and Otherwise," One Person Show, A Votre Sante Restaurant, Venice CA. 1990	 "Mural Drawings, Paintings and Prints," Grossman Gallery, Lompoc CA. 1988	 "Los Angeles Mural Conservancy Exhibition & Silent Auction," The Art Store Gallery, Los Angeles CA. 1979	 "Drawings, Lithographs, Mural Concepts & Documentations," One Person Show, Santa Monica Public Library, Santa Monica CA. "Drawings, Mural Concepts, Documentations," One Person Show, Occidental College, Los Angeles CA.